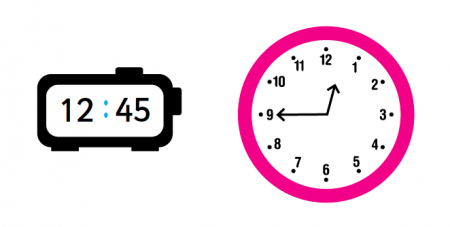 We explain what analogue and digital are and how and when children are taught to read clock faces and convert between analogue and digital times in primary school. An analogue clock is a circular-faced clock with the numbers one to twelve around the outside and two hands, a shorter one to measure hours and a longer one to measure minutes. A digital clock is a clock which simply shows numbers to denote the time. It is usually battery or electricity powered. How do children learn to read analogue and digital clocks? Children learn to tell the time in Key Stage 1 on an analogue clock. It can take children a while to understand that concept of what each hand represents, so Year 1 teachers will start with teaching children that if the long hand is on the 12 and the short hand is on the 8, then it is 8 o'clock. They will usually spend plenty of time getting children used to the 'o'clock' time, pointing to the clock at various times of day, so that children are aware of what happens at 9 o'clock, 11 o'clock, 1 o'clock, 3 o'clock etc. Once children are clear on this, a teacher will move onto 'half past' times. Again, they will spend some time on this until children are confident. Year 2 children need to be able to tell the time to five minutes, including quarter to/past. In Year 4, children need to read, write and convert the time between analogue and digital 12- and 24-hour clocks. In Years 5 and 6, children need to solve problems involving converting between units of time.